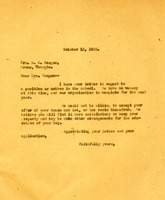 Berry responds to a letter from Reagan seeking a position as matron and proposing to use her house and lot in exchange for schooling for her son. 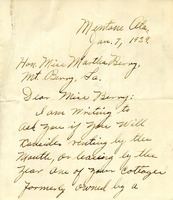 Mrs. Marshall encloses her rent check which Mr. Keown asked her to mail. 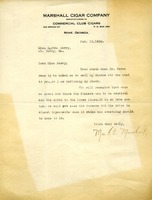 Mrs. Marshall also tells Martha Berry that she doesn't need the furnace fixed anymore, but the drive to the house is still in need of repair. 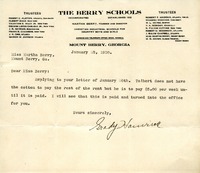 Mr. Hamrick informs Martha Berry that Tolbert does not have enough cotton to pay rent, but he will pay $5 per week until his rent is paid. 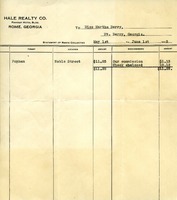 Rent Statement to Martha Berry from Hale Realty Co.
Hale Realty Co. sends the Noble Street property rent statement to Martha Berry. 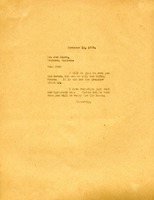 Miss Berry will be glad to rent the Spring House to him. She will need to know when he is ready for the house.